Sexist Coverage of Beto O'Rourke? Sexist Coverage of Beto O’Rourke? Would a similarly-situated woman be getting such over-the-top coverage? A Twitter meme from a couple days ago is now gaining legs in longform. Warren is by any measure more qualified for the Presidency than O’Rourke. Still, it’s arguable that she’s an old story—and that she had a turn in the spotlight of her own and simply failed to capitalize on it by running in 2016 and her 15 minutes has ended. Then again, there’s no Hillary Clinton in the field this time. In fairness, though, this isn’t necessarily sexist. Clinton was treated as the pre-ordained winner in both 2008 and 2016. Obama was clearly a star and essentially brand new on the scene but few thought he could possibly defeat her experience and the Clinton Machine; he was just an interesting new story contrasted to someone who had been in the national spotlight for sixteen years. Harris is as close to an Obama parallel as it gets: she has been in the Senate for two years and is young and charismatic. But so many candidates—and so many women candidates—announced or hinted that they’re running at the same time that they may just be canceling themselves out. Gillibrand and Klobuchar have been on the national scene quite a bit longer—although they’re also both relatively young. But it’s not obvious that anyone was clamoring for them to run. 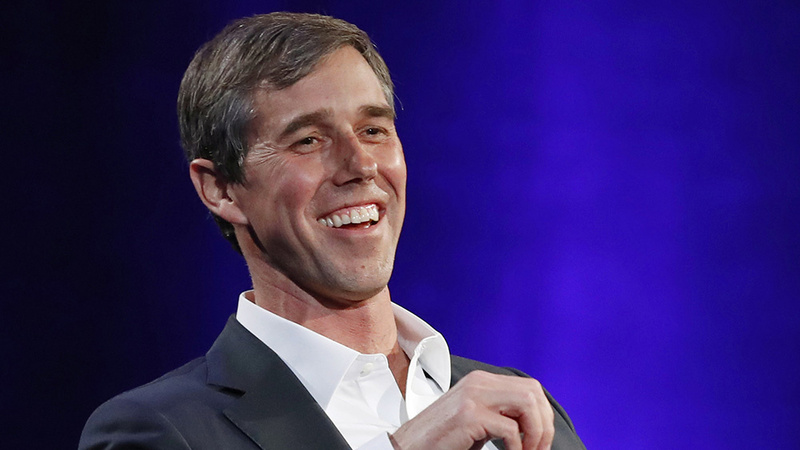 O’Rourke went viral because his impassioned response to a question about athletes kneeling during the national anthem went viral on YouTube and then he followed up by giving the hated Ted Cruz a real run for his money. He’s also got an interesting-for-a-politician past as something of a bad boy punk rocker. Still, it’s hard to take him seriously as a Presidential candidate. While the 2018 midterm elections set the stage for women making historic gains in Congress — and last month marked another groundbreaking moment when five women officeholders joined the presidential race — no woman on the Democratic side received the kind of wall-to-wall coverage O’Rourke received. 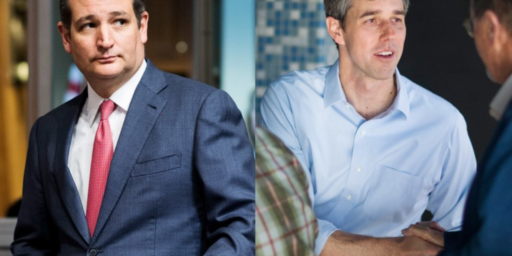 And unlike O’Rourke, who rocketed to stardom last year as he raised a record-breaking $80 million in his unexpectedly close defeat to Republican Texas Sen. Ted Cruz, all of them had won their last election. His comments, which to some Democrats carried the scent of white male privilege, set fire to a whole different set of frustrations. “A woman could never say ‘I was born to do this.’ But you know what? I think that some women were and it pains me that a woman couldn’t get away with saying that,” Sefl said. Other female Democratic operatives questioned whether the women candidates could have gotten away with some of the comments O’Rourke made Thursday about his parenting style, or taken the kind of well-publicized, sans-family road trip he took earlier this year. “I actually really like Beto, but all you have to do is put his quotes into the mouth of a hypothetical woman candidate: she ‘sometimes’ takes care of her kids, she was ‘born for this’, her speech was just ‘amazing, every word pulled out of me’ to know that women would not be the object of adoration,” said Jess McIntosh, a Democratic strategist and former senior communications staffer on the Hillary Clinton campaign. None of this is or should be fatal to his campaign. He’s a newcomer to the national scene and still feeling his way. Still, these comments would certainly have landed differently were he a woman. Now, it’s certainly possible for a woman to be the “it” candidate and get the star treatment O’Rourke has gotten. Another losing candidate* from the 2018 cycle, Stacy Abrams, has gotten unusual treatment, indeed, including being chosen to deliver the Democratic response to the State of the Union and touting herself as a potential 2020 Presidential candidate. More obviously, Alexandria Ocasio-Cortez has gotten very much the same sort of breathless coverage that O’Rourke has—including late night talk show appearances and magazine covers. That’s incredibly unusual for a freshman House member. Were she 34 rather than 29, she’d almost certainly be touted as a Presidential contender. Then again, she has at least generated actual policy ideas and shaped the debate. O’Rourke, by contrast, has sparked a minor cottage industry of stories wondering what it is he believes in. *Granted, there were legitimate questions about the legitimacy of Abrams’ less that didn’t exist in O’Rourke’s case. Still, it’s unusual for losing an election to be a catapult to a campaign for even higher office. Biddle LeCork’s campaign will be a very good compliment to Blamey Klobberchild’s “Howard Schultz without the charisma” campaign strategy. It will also have the effect of making Kamallama Huron look policy focused, which can only be good for her. When are Democrats going to throw this “privileged white man” garbage in the trash? On paper, Beto is a lightweight. But, let’s look at this from another angle — One of the skills we need to consider for any candidate is whether they piss off the press. That’s the heart of electability right there. That’s the difference between fawning coverage, and a constant focus on emails. But, back to the question in the headline, is he getting special treatment for being a white man? Probably. Almost certainly. And yes, that’s a problem with America. But, if we have that problem, and a woman candidate is going to get eviscerated with nonsense in the general campaign, I’d rather it happen in the primaries, and we nominate a lesser-but-good-enough candidate who can win, rather than a more-qualified candidate who will lose. But, I don’t think it’s all just sexism — I think Beto is naturally charismatic, with a passion and an energy that excites people. And I think the people who meet him (especially the press) just plain *like* him on a personal level. Don’t underestimate the power of that in shaping coverage. With all those “But”s, I should mention Buttigieg. I really want Buttigieg to run for Governor or Senate or the House or something. He should have a big future. Eh. I think it’s more because he hails from Texas and almost managed to knock off Cruz. That’s pretty damn impressive in anyone’s book. Also, he’s the Newbie on the Block and we know full well that media reporters are as lured by shiny objects as a two-month old kitten. Also yeah, fresh-faced white Obama. If Beto is still the front-runner obsession in the media in three months then I’ll rethink my theory. President Trump and then the host of ‘The Five’ on Fox News made comment on O’Rourke’s hand gestures when talking. What’s the big deal? Fr Robert Barron, now Bishop Barron, in his Catholicism series is always motioning with his hands. I’m taking part in a media focus group right now and when talking about O’Rourke’s hand gestures I was doing my own. @Ben Wolf: Don’t want to worry you, but have you had yourself checked for prion diseases lately? check out the Preet Bharara podcast with Buttigieg. I listened to it last night. Holy cow. That guy’s got some serious mental horsepower. @Teve: The more I see and hear him, the more I like him. How wonderful it would be to have a President who could speak in full, coherent sentences again! At least you can see Beto’s hands when he is talking. You need binoculars to see Trump’s. President Trump and then the host of ‘The Five’ on Fox News made comment on O’Rourke’s hand gestures when talking. @Ben Wolf: Every time I see O’Rourke my first thought is Tony Robbins. Beto seems upbeat, positive, and can unite people; another Hubert Humphrey. He is short on practical ideas and doesn’t seem to have a clear plan. All this criticism from people about all the attention he is getting is misguided. Senator Warren has experience and some good ideas, but her manner does not do much to attract people. Her voice is like nails on a chalkboard and she often comes across negative. 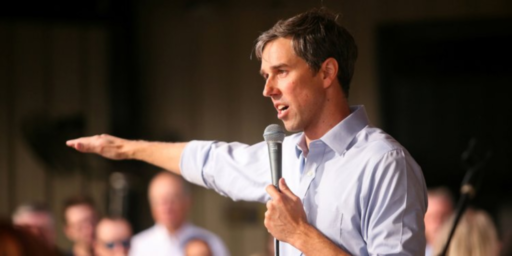 Beto would do well to ditch the high school science teacher shirts and try a Dallas Cowboys jersey or hat. That would get a lot of attention. @Tyrell: A Texan Tony Robbins is not a bad description of Beetle. I have to admit that I’m a little torn about this aspect of Beto’s candidacy. On the one hand, we are long past the point where we should have already had a female President; and I think most people who hold this belief would prefer that the first female President be a Democrat, as opposed to a Republican like say Nikki Haley. As such, I would still be surprised if a white male candidate is able to win the Democratic nomination. (If I had to bet today I’d still say the nominee will be Kamala Harris … even though she is not who I will likely vote for in the Texas primary). That being said, it would be wrong for Democrats (or anybody) to posit that a talented, charismatic individual such as Beto O’Rourke shouldn’t be a nominee for President simply because he happened to have been born a white male and is running in an era where the country (and more specifically, his party) are becoming much more diverse. As for the sexism charge: I think (and this may be an unpopular opinion with some) that the continual complaining from the Clinton ’16 campaign about perceived sexism in the way they were covered probably did as much (or possibly more) damage to her chances of winning as any actual sexism that took place. In other words, fair or not, this type of complaining about media coverage is unlikely to suddenly suddenly result in more (positive) air time for female candidates .. and could very possibly actually damage some of their campaigns (again, not saying that’s fair). The fact is, the media’s “agenda” involves covering the stories that are likely to draw the most eyeballs (and thus advertising dollars). Charisma and an interesting backstory will pretty much always trump an impressive resume and well thought out policy proposals in that regard.